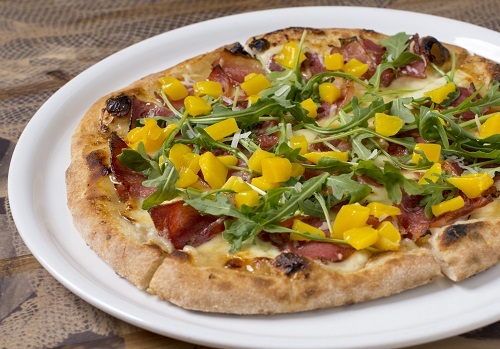 Try this gourmet twist on the old Tropical favourite with bacon and pineapple; a juicy, fresh rib and mango pizza! 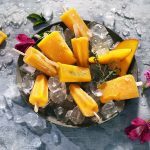 The sweet flavours of the fruit complement the salty flavours of the ribs and cheese, while the rocket and spring onion cut through to give a peppery crunch. Simply prepare your ribs as per your tried and trusted rib recipe, with your favour basting and marinade. Here is a great recipe for Sticky BBQ Pork Ribs. Does fruit belong on a pizza?! Do you think Mango and rib go together? Tell us on Facebook, what you think. 1Pour 1 ½ warm water into a large bowl and sprinkle with yeast and allow to foam for 5 minutes. 2Whisk sugar, oil and salt into your yeast mixture. 3Add flour and stir in until sticky dough forms. 4Transfer dough into an oiled bowl, brush the top with oil. Cover with cling film or a clean dish cloth and set aside in a warm place for an hour, or until it rises to double the size. 5Once ready, turn out onto a flour-dusted surface, and gently knead before using. 66. Divide into 4 balls, and roll out into flat discs. You can freeze pizza dough for up to 3 months, by wrapping it in plastic. Divide it into the sizes you will need before freezing. 1Mix sugar and garlic into your tomato paste and spread onto your bases. 2Equally distribute ribs, spring onion, sauce, cheese and herbs onto your pizza. 3Bake at 250 degrees C, in a preheated oven for 10-15 minutes. 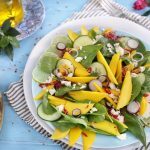 4Add your fresh mango and rocket, and serve immediately. Hint: You can purchase ready-made pizza bases for a quick and easy meal. Pizza dough recipe courtesy of Martha Stewart.